Share Your Family’s Exciting Past. Here’s the Why and How. Your family story matters. The ability to pass it on is the power to reorient and anchor a life and the collective life of a family. It gives light, purpose and understanding. It explains and empowers. 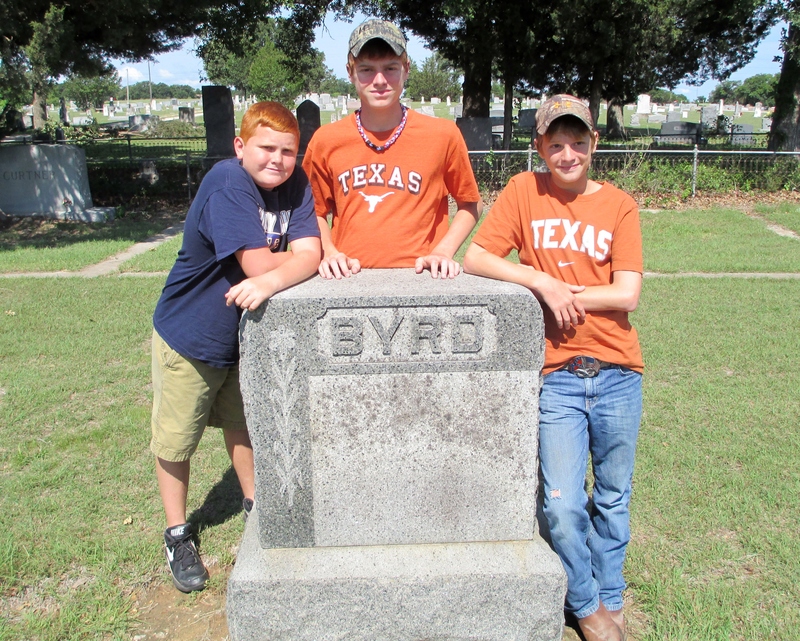 Chase, Chandler and Clayton Collins at their 4 x great-parents Pleasant Wesley & Rachel Marinda Byrd’s grave in Chico, Texas in 2012. The ancients in oral cultures used the term “remember”. They set up sign posts, memorials which pointed to and explained the past. Fathers and mothers were instructed to recount and remind their children of their past, not simply their lives but the lives of those who went before them. The goal was to establish “connection” in each generation to their God and their progenitors, to know their vision and values, to understand and restate their goals as a people. My appeal as an old man is NOT for a return to “old-fashioned” ways and practices. I’m much more interested in function than I am form. I urge you to consider this appeal. We need not convince our children and grandchildren to turn-back-the-clock and give up their mobile devices, dress in a previous fashion, worship in particular ways or spaces, give up their vehicles for horses, enjoy the piano only music of the 19th century beer halls and churches or the organ music of the 20th century vaudeville theaters, etc. God-seeking parents can demonstrate and encourage their children and grandchildren to seek God. Freedom loving Americans can demonstrate and encourage their children and grandchildren to love freedom. 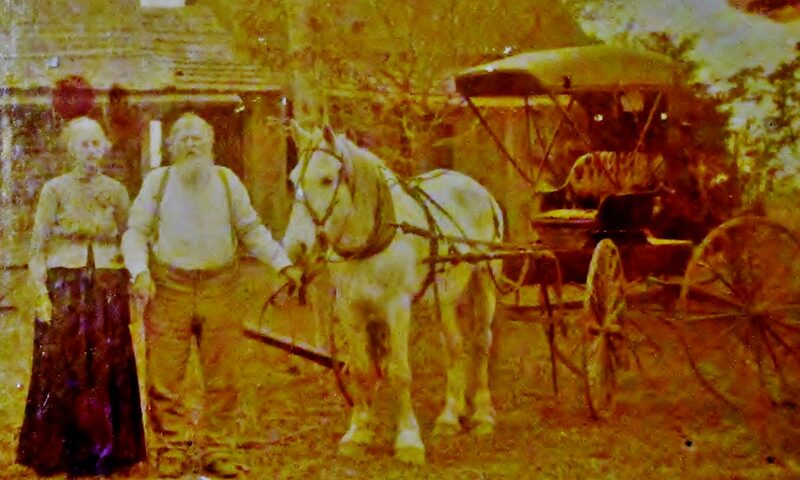 These driving values of early Americans may constantly be renewed and understood. When our families know their past, they’re better able to walk into their future. When they understand God-given rights, they understand their freedom to choose how they respond to their family’s unique history and their nation’s call. a line of descent traced continuously from an ancestor. the study and tracing of lines of descent or development. a plant’s or animal’s line of development from earlier forms. My genealogy journey is just over four years in duration. The serious research of my family’s history began in 2012. I do not consider myself a genealogist. I’m a family historian using the proof standards of the genealogist to discover and recover my family’s past. My goal is not simply uncovering lines of descent but uncovering lives and telling their stories. I expect their impact to inform, entertain, encourage and inspire. If I do it well. Our third son Chris recently asked me, “Dad, what is it about you and all of this family history stuff?” Fair question. The kind of question I would expect from this child. He grew up and began his own family before he ever heard his father speak of genealogy. Now…well…you understand. Most of you have seen the glassy stare or family members or watched them roll their eyes as you shared simple or fascinating facts about their ancestor. You’ve seen them express more interest in discussing today’s reality “stars” or some fictional characters in a book than real people from their rich past with whom they share DNA. What is it about me and all of this family history stuff? I’ve always been naturally curious, enjoyed a good mystery, and loved history. I’ve lived a very busy life. I’ve had considerable demands on my time and like everyone else, I needed to prioritize. I’ve lived long enough now to see the end. I have little time left to recover and record my family’s past. I need to prioritize. I’ve lived most of my life with little knowledge of my family and our history, our story. I felt no connection. I knew nothing of the “source of our vigor”. Our story is in peril. Hundreds of genealogists and thousands upon thousands of family historians know exactly what I mean. You understand the pull of “all this family history stuff”. What shall we do? What do we do with the facts we’ve recovered? How do we connect them to the present? How do we tell our family’s story? If our goal is to present a true and accurate family picture, good research must always precede good writing. If we’re going to present fables as facts, we need not “waste our time” doing the hard research. Simply write the fables. If you choose however to do the hard research and wish to accurately portray these facts, think about the kind of writing which holds your attention. Read it. Practice writing it. Take your known facts and write in that fashion. Have something to share. Do the work. Do the necessary research. Know the family facts and the history surrounding those facts. Connect your family’s stories to their times. Intermingle well-known historical facts and people with the stories of your family. Provide the context. Connect your family dots by telling a story. Grab their attention. Use a quote, question, statement or mystery. Dare them not to keep reading. Of course, some may not! If you want to be interesting, serve your readers and listeners. Always keep them and their interests in mind as you write or form the stories you’ll tell. Some practical ways to involve our families in their history. Family Feud. Our immediate family consists of seven grown children and their families. 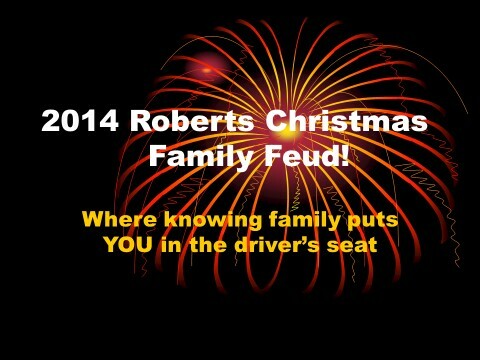 (Yes, same mother, same father) At our Christmas gathering we play a game I’ve shamelessly stolen and named “Family Feud”. The teams consist of the seven family units. They’re playing for the order in which a set of gift cards will be selected from off of the tree, 1 – 7. I prepare a power point series of slides with questions about our family’s history. Photos or historical documents are often used. Points accumulate for each correct answer and are tallied up when all the slides are revealed. The top scoring family selects first and so on down the list. 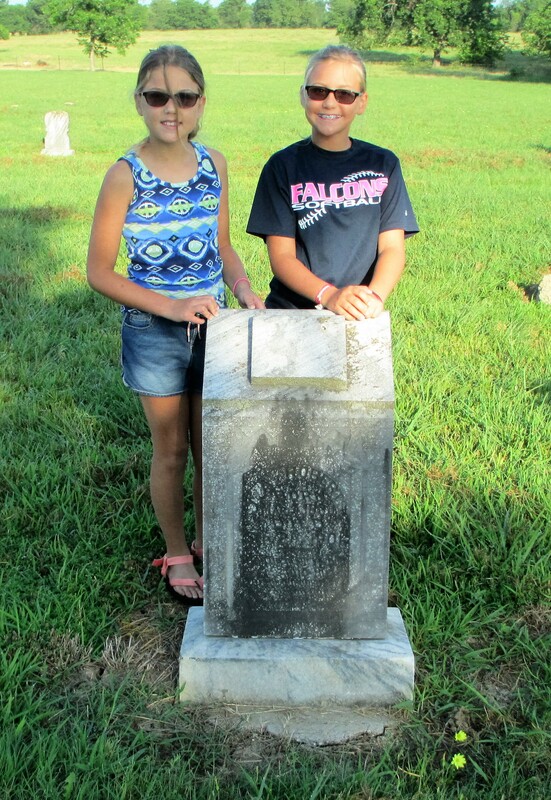 Ashton and Mia Armstrong at the grave of their great-grandfather B.L. 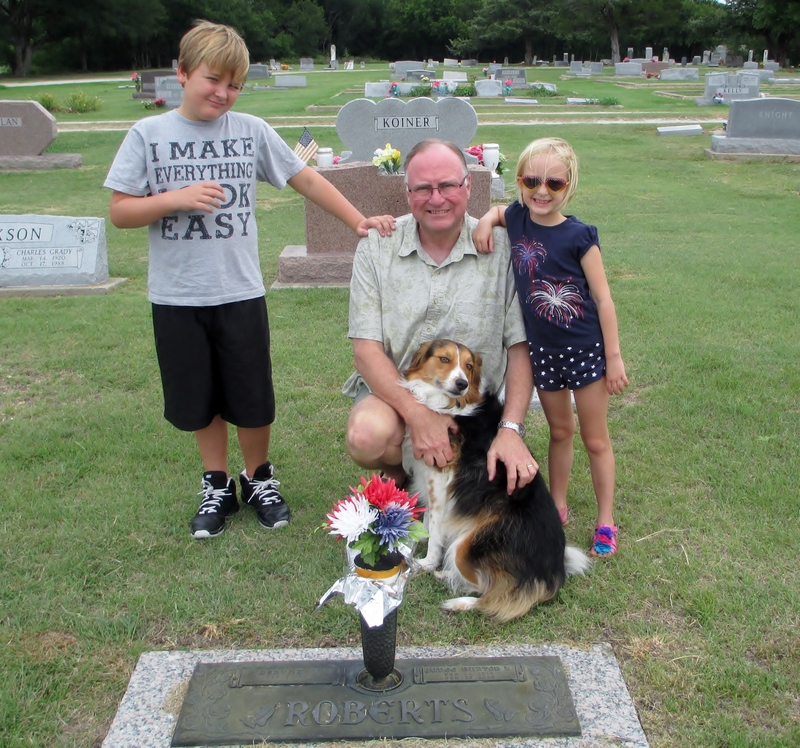 Roberts in Denton County, Texas in 2013. Mia is my biggest blog reader and wonders why I don’t write more about my grandchildren. Begin an online Blog. Don’t cringe. We live in a written and visual culture. Free blogs are available and easily accessible. [ii] Blogs allow you free space online to share your thoughts and make them available to groups of people or to a broader public. It’s an inexpensive way to make any or all of your research accessible to your family. My grown children spend very little time on my blog. (There is an uptick near Christmas.) 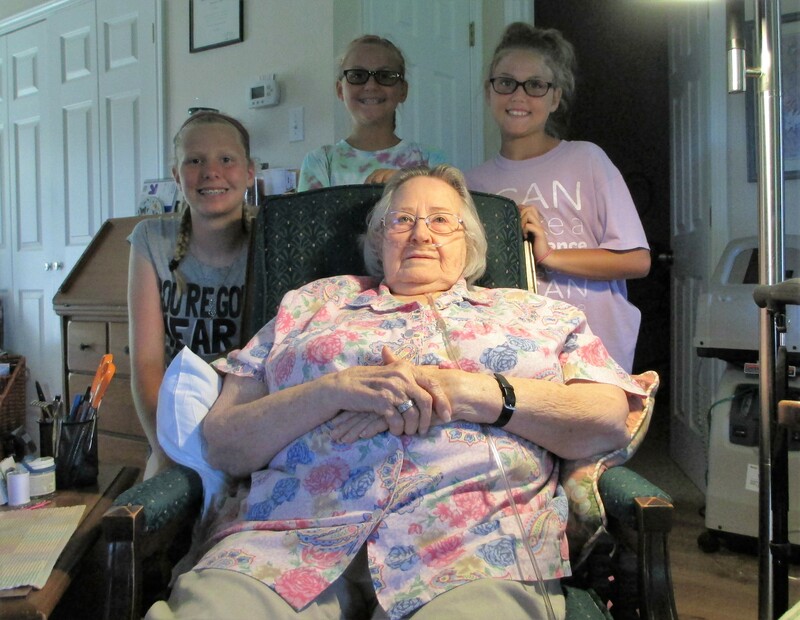 My grandchildren are beginning to access the blog some – and some more than others. The reality– our families may never care about our family stories the way we do. But a free blog means that when we’re dead and gone, the research will be easily available online if they decide to access it. Tell Stories. As you discover new facts about your family, think about an interesting way to introduce these facts in an exciting story-form. Look for opportunities to share these little vignettes with your family members. Take Trips. 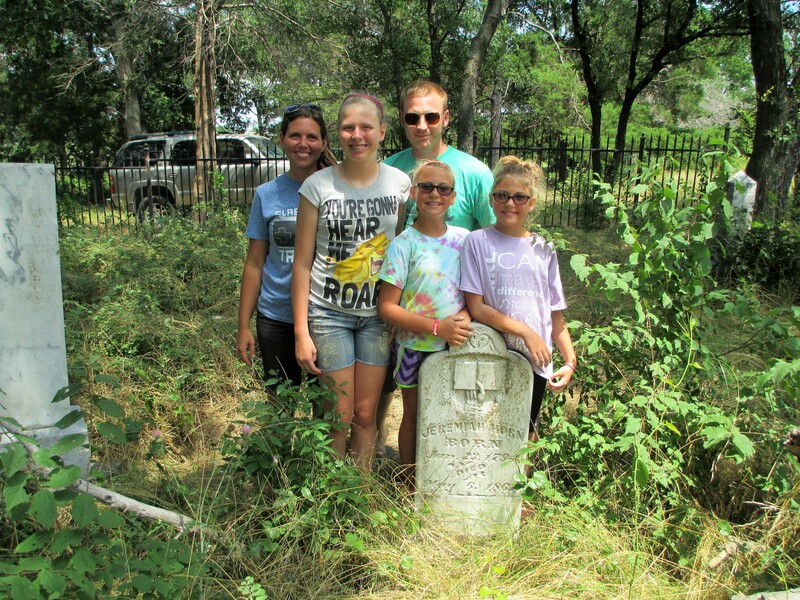 Plan “family history tours” with you children or grandchildren. They may be half day, one day or multiple day trips. Visit places of family significance, cemeteries where you have family buried, history museums, libraries, research centers, etc. Do grave marker etchings. Be prepared and always tell stories as you go. Interview older family members. Involve your children or grandchildren in the process. Set an example with your questions. Then, allow them to ask questions. Capture the event in photos and on video. Make these videos available on free resources such as YouTube. If you need help with the technical side of things, ask your children or grandchildren to help you do it! Invite your family members to write a guest blog on you site. Publish sections of family timelines and pass them out at gatherings. Have family members re-enact episodes of your family’s story. These are a few of the ways to bring our families into the process. Use the comment section and share some of your ideas to involve our families. My grandfather Gus Roberts grew up in the Masonic Home for Children in Fort Worth, Texas. His lack of knowing or an unwillingness to tell his family’s story almost ended the knowledge of our past. Backtracking this family has opened up the rich and diverse history of our multiple family lines. The nuggets continue to be mined from our family’s story and their value is incalculable. I wish for you this same joy. I encourage you to follow this blog. Sign up to the receive free updates. Never stop learning. Be inspired! Yes! Very well said, with fantastic family-involving ideas. Thanks Melissa for your comment! Feel free to pass the link on to others. Gary I love your ideas on getting your children involved with the history of your family. Thank you Tonya for taking the time to read and comment. Please continue sharing the link with your friends. Great post, Gary! I think I may try your family game this Christmas! Thanks Deborah for the comment! You’re a good “cousin encourager”. Now, how about writing the story of John Joshua Roberts? We could post it on this blog in a serial fashion or all at once. Great ideas and like how you’ve taken your experience to the next level–handing the knowledge to the kids and grands. Thank you Linda! Now, are you formulating a research and writing plan for the life of James Richard Roberts? We can post some episodes on the blog. Hoping to see you in North Texas late this fall. Next PostNext Did you see this great tip from Amy Johnson Crow?